The Imperial Territory of Alsace-Lorraine (German: Reichsland Elsaß-Lothringen or Elsass-Lothringen) was a territory created by the German Empire in 1871, after it annexed most of Alsace and the Moselle department of Lorraine following its victory in the Franco-Prussian War. The Alsatian part lay in the Rhine Valley on the west bank of the Rhine River and east of the Vosges Mountains. The Lorraine section was in the upper Moselle valley to the north of the Vosges. Since 2016, the historical territory is now part of the French administrative region of Grand Est. The modern history of Alsace-Lorraine was largely influenced by the rivalry between French and German nationalism. France long sought to attain and preserve its "natural boundaries", which were the Pyrenees to the southwest, the Alps to the southeast, and the Rhine River to the northeast. These strategic claims led to the annexation of territories located west of the Rhine river in the Holy Roman Empire. What is now known as Alsace was progressively conquered by Louis XIV in the 17th century, while Lorraine was incorporated in the 18th century under Louis XV. German nationalism, which resurfaced following the French occupation of Germany under Napoleon, sought to unify all the German-speaking populations of the former Holy Roman Empire of the German Nation into a single nation-state. As various German dialects were spoken by most of the population of Alsace and Moselle (northern Lorraine), these regions were viewed by German nationalists to be rightfully part of hoped-for united Germany in the future. We Germans who know Germany and France know better what is good for the Alsatians than the unfortunates themselves. In the perversion of their French life they have no exact idea of what concerns Germany. Shading shows départements before 1870; black lines after 1871. Only the département of Meurthe changed name and became Meurthe-et-Moselle after the border changes; border between 1871 and 1918 in yellow. The loss of Alsace and Lorraine personified – statue in Nancy, in the French part of Lorraine. "The Black Stain": In France, children were taught in school not to forget the lost provinces, which were coloured in black on maps. Painting by Albert Bettannier, a native of Metz who fled to Paris after the annexation of his hometown. However, the German Emperor, Wilhelm I, eventually sided with army commander Helmuth von Moltke, other Prussian generals and other officials who argued that a westward shift in the French border was necessary for strategic military and ethnographic reasons. From an ethnic perspective, the transfer involved people who for the most part spoke Alemannic German dialects. From a military perspective, by early 1870s standards, shifting the frontier away from the Rhine would give the Germans a strategic buffer against feared future French attacks. Due to the annexation, the Germans gained control of the fortifications of French-speaking Metz, as well as Strasbourg (Straßburg) on the left bank of the Rhine and most of the iron resources of Lorraine. However, domestic politics in the new Reich may have been decisive. Although it was effectively led by Prussia, the new German Empire was a decentralized federal state. The new arrangement left many senior Prussian generals with serious misgivings about leading diverse military forces to guard a prewar frontier that, except for the northernmost section, was part of two other states of the new Empire – Baden and Bavaria. As recently as the 1866 Austro-Prussian War, these states had been Prussia's enemies. In the new Empire's constitution, both states, but especially Bavaria, had been given concessions with regard to local autonomy, including partial control of their military forces. For this reason, the Prussian General Staff argued that it was necessary for the Reich's frontier with France to be under direct Prussian control. Creating a new Imperial Territory (Reichsland) out of formerly French territory would achieve this goal: although a Reichsland would not be part of the Kingdom of Prussia, being governed directly from Berlin it would be under Prusso-German control. Thus, by annexing Alsace-Lorraine, Berlin was able to avoid complications with Baden and Bavaria on such matters as new fortifications. Memories of the Napoleonic Wars were still quite fresh in the 1870s. Right up until the Franco-Prussian War, the French had maintained a long-standing desire to establish their entire eastern frontier on the Rhine, and thus they were viewed by most 19th century Germans as an aggressive people. In the years before 1870, it is arguable that the Germans feared the French more than the French feared the Germans. Many Germans at the time thought that the creation of the new Empire in itself would be enough to earn permanent French enmity, and thus desired a defensible border with their old enemy. Any additional enmity that would be earned from territorial concessions was downplayed as marginal and insignificant in the overall scheme of things. The annexed area consisted of the northern part of Lorraine, along with Alsace. The area around the town of Belfort (now the French département of Territoire de Belfort) was unaffected, because Belfort had been defended by Colonel Denfert-Rochereau, who surrendered only after receiving orders from Paris, and was compensated by another territory. The town of Montbéliard and its surrounding area to the south of Belfort, which have been part of the Doubs department since 1816, and therefore were not considered part of Alsace, were not included, although they were a Protestant enclave, as it belonged to Württemberg from 1397 to 1806. This area corresponded to the French départements of Bas-Rhin (in its entirety), Haut-Rhin (except the area of Belfort and Montbéliard), and a small area in the northeast of the Vosges département, all of which made up Alsace, and the départements of Moselle (four-fifths of it) and the northeast of Meurthe (one-third of Meurthe), which were the eastern part of Lorraine. The rest of the département of Meurthe was joined with the westernmost part of Moselle which had escaped German annexation to form the new département of Meurthe-et-Moselle. The new border between France and Germany mainly followed the geolinguistic divide between French and German dialects, except in a few valleys of the Alsatian side of the Vosges mountains, the city of Metz and its region and in the area of Château-Salins (formerly in the Meurthe département), which were annexed by Germany although most people there spoke French. [note 2] In 1900, 11.6% of the population of Alsace-Lorraine spoke French as their first language (11.0% in 1905, 10.9% in 1910). That small francophone areas were affected, was used in France to denounce the new border as hypocrisy, since Germany had justified the annexation on linguistic grounds. However, the German administration was tolerant of the use of the French language (in sharp contrast to the use of the Polish language in the Province of Posen), and French was permitted as an official language and school language in those areas where it was spoken by a majority. This would only change with the First World War in 1914. The Treaty of Frankfurt gave the residents of the region until October 1, 1872 to choose between emigrating to France or remaining in the region and having their nationality legally changed to German. About 161,000 people, or around 10.4% of the Alsace-Lorraine population, opted for French citizenship (the so-called Optanden); however, only about 50,000 actually emigrated, while the rest acquired German citizenship. The sentiment of attachment to France stayed strong at least during the first 16 years of the annexation. During the Reichstag elections, the 15 deputies of 1874, 1881, 1884 (but one) and 1887 were called protester deputies (fr: députés protestataires) because they expressed to the Reichstag their opposition to the annexation by means of the 1874 motion in the French language: « May it please the Reichstag to decide that the populations of Alsace-Lorraine that were annexed, without having been consulted, to the German Reich by the treaty of Frankfurt have to come out particularly about this annexation. » The Saverne Affair (usually known in English-language accounts as the Zabern Affair), in which abusive and oppressive behaviour by the military towards the population of the town of Saverne led to protests not just in Alsace but in other regions, put a severe strain on the relationship between the people of Alsace-Lorraine and the rest of the German Empire. Under the German Empire of 1871–1918, the annexed territory constituted the Reichsland or Imperial Territory of Elsaß-Lothringen (German for Alsace-Lorraine). The area was administered directly from Berlin, but was granted limited autonomy in 1911. This included its constitution and state assembly, its own flag, and the Elsässisches Fahnenlied ("Alsatian Flag Song") as its anthem. FVp: Progressive People's Party. formed in 1910 as a merger of all leftist liberal parties. In French foreign policy, the demand for the return of Alsace and Lorraine faded in importance after 1880 with the decline of the monarchists element. 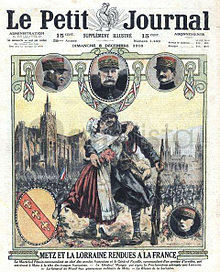 When the World War broke out in 1914, recovery of the two lost provinces became the top French war goal. In the early 20th century, the increased militarization of Europe, and the lack of negotiation between major powers, led to harsh and rash actions taken by both sides in respect to Alsace-Lorraine during World War I. As soon as war was declared, both the French and German authorities used the inhabitants of Alsace-Lorraine as propaganda pawns. Germans living in France were arrested and placed into camps by the French authorities. Upon occupying certain villages, veterans of the 1870 conflict were sought out and arrested by the French army. The Germans responded to the outbreak of war with harsh measures against the Alsace-Lorraine populace: the Saverne Affair had convinced the high command that the population was hostile to the German Empire and that it should be forced into submission. German troops occupied some homes. The German military feared French partisans – or francs-tireurs, as they had been called during the Franco-Prussian War – would reappear. German authorities developed policies aimed at reducing the influence of French. In Metz, French street names, which had been displayed in French and German, were suppressed in January 1915. Six months later, on July 15, 1915, German became the only official language in the region, leading to the Germanization of the towns’ names effective September 2, 1915. German authorities became increasingly worried about renewed French nationalism. The Reichsland governor stated in February 1918: "Sympathies towards France and repulsion for Germans have penetrated to a frightening depth the petty bourgeoisie and the peasantry". But in order to spare them possible confrontations with relatives in France but also to avoid any desertion from the Alsatian soldiers to the French army,[note 5] German Army draftees from Alsace-Lorraine were sent mainly to the Eastern front, or the Navy (Kaiserliche Marine). About 15,000 Alsatians and Lorrainers served in the German Navy. 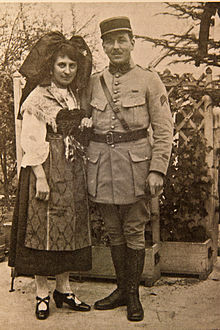 In the general revolutionary atmosphere of the expiring German Empire, Marxist councils of workers and soldiers (Soldaten und Arbeiterräte) formed in Mulhouse, in Colmar and Strasbourg in November 1918, in parallel to other such bodies set up in Germany, in imitation of the Russian equivalent soviets. In this chaotic situation, Alsace-Lorraine's Landtag proclaimed itself the supreme authority of the land with the name of Nationalrat, the Soviet of Strasbourg claimed the foundation of a Republic of Alsace-Lorraine, while SPD Reichstag representative for Colmar, Jacques Peirotes, announced the establishment of the French rule, urging Paris to send troops quickly. While the soviet councils disbanded themselves with the departure of the German troops between November 11 and 17, the arrival of the French Army stabilized the situation: French troops put the region under occupatio bellica and entered Strasbourg on November 21. The Nationalrat proclaimed the annexation of Alsace to France on December 5, even though this process did not gain international recognition until the signature of the Treaty of Versailles in 1919. Alsace-Lorraine was divided into the départements of Haut-Rhin, Bas-Rhin and Moselle (the same political structure as before the annexation and as created by the French Revolution, with slightly different limits). Today, these territories enjoy laws that are significantly different from the rest of France – these specific provisions are known as the local law. 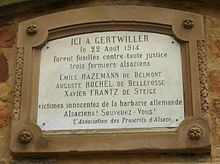 The French Government immediately started a Francization campaign that included the forced deportation of all Germans who had settled in the area after 1870. For that purpose, the population was divided in four categories: A (French citizens before 1870), B (descendants of such French citizens), C (citizens of Allied or neutral states) and D (enemy aliens - Germans). By July 1921, 111,915 people categorized as "D" had been expelled to Germany. German-language Alsatian newspapers were also suppressed. After the defeat of France in the spring of 1940, Alsace and Moselle were not formally annexed by Nazi Germany. Although the terms of the armistice specified that the integrity of the whole French territory could not be modified in any way, Adolf Hitler, the German Führer, drafted an annexation law in 1940 that he kept secret, expecting to announce it in the event of a German victory. Through a series of laws which individually seemed minor, Berlin took full control of Alsace-Lorraine, and Alsatians-Lorrainians could be drafted into the German Army. During the occupation, Moselle was integrated into a Reichsgau named Westmark and Alsace was amalgamated with Baden. Beginning in 1942, people from Alsace and Moselle were made German citizens by decree of the Nazi government. Beginning in October 1942, young Alsatian and Lorrainian men were inducted into the German armed forces. Sometimes they were known as the malgré-nous, which could be translated in English as "against our will". [note 7] A small minority, however, volunteered, notably the author of The Forgotten Soldier, known by the pseudonym Guy Sajer. Ultimately, 100,000 Alsatians and 30,000 Mosellans were enrolled, many of them to fight on the Eastern Front against the Soviet Red Army. Most of those who survived the war were interned in Tambov in Russia in 1945. Many others fought in Normandy against the Allies as the malgré-nous of the 2nd SS Panzer Division Das Reich, some of which were involved in the Oradour sur Glane and Tulle war crimes. Speaking Alsatian, Lorraine Franconian or French was prohibited under German occupation, and learning German was obligatory. When Alsace and the Lorraine department became part of Germany, the French laws regarding religious bodies were preserved, with special privileges to the then recognised religions of Calvinism, Judaism, Lutheranism and Roman Catholicism, under a system known as the Concordat. However, the Roman Catholic dioceses of Metz and of Strasbourg became exempt jurisdictions. The Church of Augsburg Confession of France [fr], with its directory, supreme consistory and the bulk of its parishioners residing in Alsace, was reorganised as the Protestant Church of Augsburg Confession of Alsace and Lorraine (EPCAAL) in 1872, but territorially reconfined to Alsace-Lorraine only. The five local Calvinist consistories, originally part of the Reformed Church of France, formed a statewide synod in 1895, the Protestant Reformed Church of Alsace and Lorraine (EPRAL). The three Israelite consistories in Colmar [de], Metz [de] and Strasbourg [de] were disentangled from supervision by the Israelite Central Consistory of France and continued as separate statutory corporations which never formed a joint body, but cooperated. All the mentioned religious bodies retained the status as établissements publics de culte (public bodies of Religion). When the new Alsace-Lorraine constitution of 1911 provided for a bicameral state parliament (Landtag of Alsace-Lorraine [fr]) each recognised religion was entitled to send a representative into the first chamber of the Landtag as ex officio members (the bishops of Strasbourg and of Metz, the presidents of EPCAAL and EPRAL, and a delegate of the three Israelite consistories). Deportation of persons considered German by the French authorities. Both Germanic and Romance dialects were traditionally spoken in Alsace-Lorraine before the 20th century. Luxembourgish Franconian aka Luxembourgish in the north-west of Moselle (Lothringen) around Thionville (Diddenuewen in the local Luxembourgish dialect) and Sierck-les-Bains (Siirk in the local Luxembourgish dialect). Moselle Franconian in the central northern part of Moselle around Boulay-Moselle (Bolchin in the local Moselle Franconian dialect) and Bouzonville (Busendroff in the local Moselle Franconian dialect). Rhine Franconian in the north-east of Moselle around Forbach (Fuerboch in the local Rhine Franconian dialect), Bitche (Bitsch in the local Rhine Franconian dialect), and Sarrebourg (Saarbuerj in the local Rhine Franconian dialect), as well as in the north-west of Alsace around Sarre-Union (Buckenum in the local Rhine Franconian dialect) and La Petite-Pierre (Lítzelstain in the local Rhine Franconian dialect). South Franconian in the northernmost part of Alsace around Wissembourg (Waisseburch in the local South Franconian dialect). Alsatian in the largest part of Alsace and in a few villages around Phalsbourg in the extreme south-east of Moselle. Alsatian was the most spoken dialect in Alsace-Lorraine. High Alemannic in the southernmost part of Alsace, around Saint-Louis and Ferrette (Pfirt in the local High Alemannic dialect). Lorrain in roughly the southern half of Moselle, including its capital Metz, as well as in some valleys of the Vosges Mountains in the west of Alsace around Schirmeck and Sainte-Marie-aux-Mines. Franc-Comtois in 12 villages in the extreme south-west of Alsace. ^ An instruction dated 1920-08-14 from the assistant Secretary of State of the Presidency of the Council to the General Commissioner of the Republic in Strasbourg reminds that the term Alsace-Lorraine is prohibited and must be replaced by the sentence "the département of Haut-Rhin, the département of Bas-Rhin and the département of Moselle". While this sentence was considered too long, some used the term Alsace-Moselle to point to the three concerned départements. However, this instruction has no legal status because it is not based on any territorial authority. ^ The linguistic border ran on the north of the new border, including in the "Alemannic" territories Thionville (also named Diedenhofen under the German Reich), Metz, Château-Salins, Vic-sur-Seille and Dieuze, which were fully French-speaking. The valleys of Orbey and Sainte-Marie-aux-Mines were in the same case. Similarly, the town of Dannemarie (and adjoining areas) were also left in Alsace when language alone could have made them part of Territoire de Belfort. ^ As of on October 26, 1914, we can read in Spindler's journal: "Then he recommends to me not to speak French. The streets are infested with informers, men and women, who touch rewards and make arrest the passers by for a simple « merci » said in French. It goes without saying that these measures excite the joker spirit of the people. A woman at the market, who probably was unaware that "bonchour" and "merci" was French, is taken with part by a German woman because she answered her "Guten Tag" by a "bonchour ". Then, the good woman, the fists on the hips, challenges her client : "Now I'm fed up with your silly stories! Do you know what? [here something like "kiss my ..."]! Is that endly also French? » (als: Jetz grad genua mit dene dauwe Plän! Wisse Sie was? Leeke Sie mich ...! Esch des am End au franzêsch?)" ^ However, on the Colmar prefecture building, the name of Belfort can be seen as a sous-prefecture. ^ Roosen, William James (2013). The age of Louis XIV: the rise of modern diplomacy. Transaction Publishers. p. 55. OCLC 847763358. ^ Cerf, Barry (1919). Alsace-Lorraine since 1870. MacMillan. ^ Finot, Jean (May 30, 1915). "Remaking the Map of Europe". The New York Times. ^ Churchill, W. S., "The World Crisis, Vol. I: 1911-1914, Bloomsbury Academic, 2015, p. 4." ^ Frederic H. Seager, "The Alsace-Lorraine Question in France, 1871-1914." in Charles K. Warner, ed., From the Ancien Regime to the Popular Front (1969): 111-126. ^ In 1914, Albert Schweitzer was put under supervision in Lambaréné, French Equatorial Africa; in 1917, he was taken to France and incarcerated until July 1918. ^ Charles Spindler, L'Alsace pendant la Guerre, 6 septembre 1914 and 11 septembre 1915. ^ Grandhomme, Jean-Noël (2008) Boches ou tricolores. Strasbourg: La nuée bleue. ^ Douglas, R.M. (2012). Ordnungsgemäße Überführung - Die Vertreibung der Deutschen nach dem Zweiten Weltkrieg (in German). C.H.Beck. pp. 94 f. ISBN 978-3-406-62294-6. ^ "Tabellarische Geschichte Elsaß-Lothringens / Französische Besatzung (1918-1940)". Archived from the original on 2009-10-25. ^ Eberhard Jäckel, La France dans l'Europe de Hitler, op. cit., p. 123-124. ^ Eberhard Jäckel, « L'annexion déguisée », dans Frankreich in Hitlers Europa – Die deutsche Frankreichpolitik im Zweiten Weltkrieg, Deutsche Verlag-Anstalg GmbH, Stuttgart, 1966, p. 123-124. ^ a b c Rademacher, Michael (2006). "Verwaltungsgeschichte Elsaß-Lothringen 1871–1919" [Administrative History of Alsace-Lorraine 1871–1919] (in German). Bankwitz, Philip Charles Farwell. Alsatian autonomist leaders, 1919-1947 (UP of Kansas, 1978). Byrnes, Joseph F. "The relationship of religious practice to linguistic culture: language, religion, and education in Alsace and the Roussillon, 1860–1890." Church History 68#3 (1999): 598-626. Harp, Stephen L. "Building the German nation. Primary schooling in Alsace-Lorraine, 1870–1918." Paedagogica Historica 32.supplement 1 (1996): 197-219. Höpel, Thomas: The French-German Borderlands: Borderlands and Nation-Building in the 19th and 20th Centuries, European History Online, Mainz: Institute of European History, 2010, retrieved: December 17, 2012. Klein, Detmar. "German-Annexed Alsace and Imperial Germany: A Process of Colonisation?." in Róisín Healy and Enrico Dal Lago, eds. The Shadow of Colonialism on Europe’s Modern Past (Palgrave Macmillan UK, 2014). 92-108. Putnam, Ruth. Alsace and Lorraine from Cæsar to Kaiser, 58 B.C.–1871 A.D. New York: G.P. Putnam's Sons, 1915. Seager, Frederic H. "The Alsace-Lorraine Question in France, 1871-1914." in Charles K. Warner, ed., From the Ancien Regime to the Popular Front (1969): 111-126. Silverman, Dan P. Reluctant Union; Alsace-Lorraine and Imperial Germany, 1871-1918 (Pennsylvania State UP, 1972). Varley, Karine. Under the Shadow of Defeat (Palgrave Macmillan UK, 2008) pp. 175–202. Baumann, Ansbert. « Die Erfindung des Grenzlandes Elsass-Lothringen », in: Burkhard Olschowsky (ed. ), Geteilte Regionen – geteilte Geschichtskulturen? Muster der europäischen Identitätsbildung im europäischen Vergleich, Munich: Oldenbourg 2013, ISBN 978-3-486-71210-0, S. 163–183. Roth, François. Alsace-Lorraine, De 1870 À Nos Jours: Histoire d'un "pays perdu". Nancy: Place Stanislas, 2010. ISBN 978-2-35578-050-9. Wikimedia Commons has media related to Alsace-Lorraine. 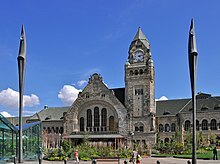 Wikivoyage has a travel guide for Alsace-Lorraine.